TA321 FW 193 on 371 , TA225 also out on daytime working. As mentioned by VE2, 9026 on the 3 - for anyone interested, it's retained it's roller blinds although the masking around the blinds has been removed. As for the other volvos sightings on the 3s, I guess they yet to put the 157 destinations on them. It would have to be that one, the only 54 reg V with no kickdown gubbins! Fingers crossed some of the others make it across. Well they will be making it across as the 157 is being converted to B7TL's. 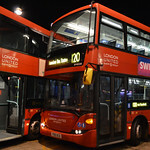 9018 and 9026 have already been out on the 3. Three VA's on the 120 seen together in Heston going towards Hounslow. None curtailed. Two 52 reg DB250/ALX400 on the 258 and VN37894 on the 487. They sometimes head direct from Lampton Rd into Kingsley Rd direct to AV to save time.